Former kindergarten teacher Ursula Piech is set to become the fifth Piech-Porsche family member on VW's supervisory board. 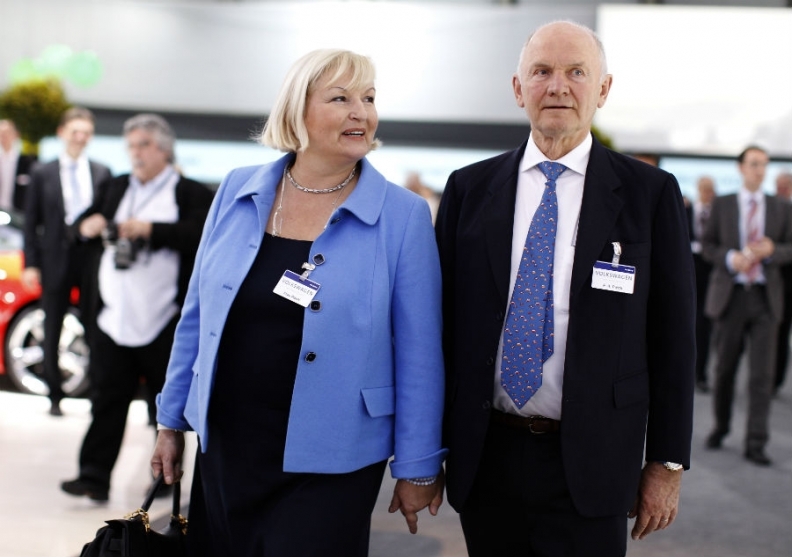 BERLIN -- Volkswagen nominated Ferdinand Piech for a third term as supervisory board chairman and proposed that his wife join the board as the Piech-Porsche family solidifies its sway over Europe's largest carmaker. VW's board is proposing Ursula Piech, 55, to replace TUI AG Chief Executive Officer Michael Frenzel, whose term expires at the annual meeting April 19, according of the Wolfsburg, Germany-based carmaker's invitation for the gathering. Ferdinand Piech, 74, will also seek another term running the board. The addition of Ursula Piech would increase the number of Piech-Porsche family members on the 20-person board to five, including Hans Michel Piech, Ferdinand Oliver Porsche and Wolfgang Porsche. The Piech-Porsche family controls Porsche Automobile Holding SE, which in turn owns a majority of VW's voting shares. "VW has in essence become an Austrian family-run company," said Ferdinand Dudenhoeffer, director of the Center for Automotive Research at the University of Duisburg-Essen. "It's the family that makes the decisions. It's unusual in a publicly listed company." Ursula Piech is a "kindergarten teacher with additional qualifications in business and law," according to information on the annual meeting invitation, which says she is currently not working. Ferdinand Piech has the support of the board to continue as chairman, people familiar with the matter said in October. The Piechs' main residence is in Salzburg, Austria. Piech has held significant influence at VW for decades, having served himself as chief executive officer before becoming board chairman. Piech pushed out then-CEO Bernd Pischetsrieder at the end of 2006 in favor of his longtime ally and current CEO Martin Winterkorn, who was Audi's chief at the time. Winterkorn said on Monday that he's known Ursula Piech for years and she's a "very competent" person that will help VW advance its goal of passing General Motors Co. as the world's largest automaker by 2018. Hans Michel Piech, Ferdinand Oliver Porsche and Wolfgang Porsche are also on VW's board. Shareholders Qatar Holding and the German state of Lower Saxony each have two board seats. Ursula Piech will be the third woman on VW's board. "Ursula Piech has for years closely followed the developments of the Volkswagen group with great interest," David McAllister, Lower Saxony's prime minister, said in an e- mailed statement backing her nomination. "With Ursula Piech we also add another competent woman to the supervisory board. That is also a positive sign." VW Group reported record results last year, with earnings before interest and taxes gaining 59 percent to 11.3 billion euros ($14.8 billion). The group sold a record 8.27 million vehicles in 2011. VW this year faces a slump in Europe and extra costs from the introduction of a new generation of its best-selling Golf hatchback, which is based on technology that will also underpin Audi, Seat and Skoda models. VW is exploring options to combine with majority shareholder Porsche after scrapping plans last year for a merger because of legal tangles. To avoid further delays, VW is closing in on a deal to purchase the remaining 50.1 percent stake in Porsche's automaking business that it doesn't already own, people familiar with the matter said on Feb. 27. Approval from German tax authorities is one of the hurdles to an agreement, which VW and Porsche are still negotiating, the people said, declining to be identified discussing private talks. VW is considering setting up an umbrella company to purchase the stake and avoid taxes that would eat up savings from the deal, according to one of the people. "There are still some hurdles to cross on the way towards full integration" with Porsche, Winterkorn said on Monday. "What I can tell you is that the integrated Volkswagen and Porsche group will happen."